I am happy to recommend a new book by my brother Don Shrader. Don is the oldest of four siblings and has always been a leader in the things of God, whether it be in the family, at his local church, in his military service as an instructor pilot, or in his life’s work as an engineer. It was his study of the Scriptures over the years that eventually produced this present volume. That study was done with the intensity of a jet pilot, the carefulness of a design engineer, the love of a father and grandfather, but most of all with a honest love of the Lord and His Word. I was honored to help proof and give input to this book. 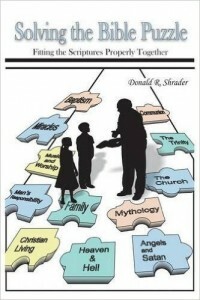 The title of the book is explained by Don on the cover, “In teaching others, I have often used the analogy, reflected in the title, that the Bible is like a giant jigsaw puzzle. Some pieces often seem to fit where they do not actually belong resulting in a puzzle improperly fit together, i.e., resulting in improper doctrines and teachings. When all the pieces are properly fit together, the doctrines, like the completed puzzle, form a unified whole.” Before beginning the 500+ pages, the reader should understand that Don is not a slavish follower of any author or theological straight jacket. You will love him at some points and be frustrated at others. Neither does Don follow every publishing protocol as to form and style, but I think you will find a very readable and easily understood book in the end. I commend him on finishing what few laymen are able to do. This should be a fitting tribute to his family and to the service of Christ.